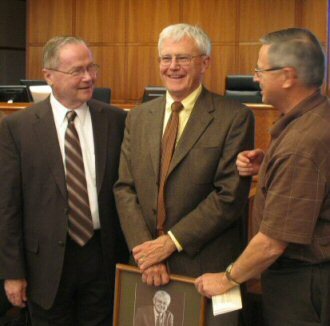 Bill Knott, center, with Conrad Gardner, left, and Keith Grebe. In 1971, Bill Knott and his wife moved to Colorado, where he took over as county librarian for Jefferson County, a position he held until his retirement in 2007. He turned Jefferson County’s library system from one-room affairs to state-of-the-art facilities. Through his efforts and leadership, the library system is nationally recognized as a pioneer and model for other systems throughout the country. Bill has fought for readers’ rights and enhanced internet services for library users. Today, more than half of Jefferson County’s citizens are library card-holders. Hal Shelton was born in 1916 in New York State but grew up in California. Field mapping experience during World War II led him to a life-long career with the U.S. Geological Survey. As an artist and teacher, he found the map symbology then used to be outdated and specialized, and set out to revise it. Becoming a terrain artist, he improved the quantity and quality of shaded relief used on maps, emphasizing topographic form and relative elevation, as well as natural color rendering. The U.S. Library of Congress commissioned him to paint a landscape, Canyon Lands, which is now housed there. After the war, Hal and his wife Mary settled in Jefferson County, where they raised four sons. 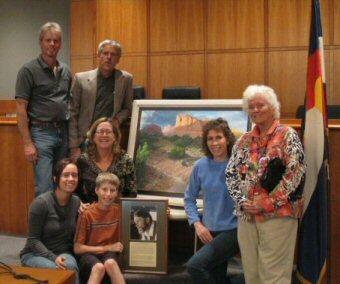 From 1958 to 1969, he served as an elected member of the Jefferson Co. Board of Education and, in 1968, was a primary founder of the Foothills Art Center.